Would You Pay Bitcasa $10 a Month for Infinite Cloud Storage? Love means never having to run out of storage. Ha ha ha, just kidding. You won’t believe it but I swear what I’m gonna tell you next is the truth and, as they say in the Bollywood movies, the whole truth and nothing but the truth. Several decades back, when I was on my second job three colleagues and I shared 20MB of storage. Yes, that’s 20MB, as in 20 Megabytes. I swear on all my readers, their children, wives, husbands, mistresses, pets and neighbors that I am not pulling a fast one. Yes, four of us shared 20MB of storage on a standalone PC at the office. And the four of us (a shrewd Tamil Brahmin guy, a wily Bunt girl, a clever Mallu fella and yours ‘innocent’ truly) never thought we’d ever run out of storage or need more! Hey, 20MB was heaven in the 20th century. Some two decades later, oh my, how times have changed. Today, most of us have several hundred gigabytes of storage on our PCs and notebooks. And storage technology is changing too – Those sure-to-fail-some-day spinning storage disks are headed to the graveyard of technology to be replaced soon by faster, and more robust, solid state drives. Yet so many of us are forever either running out of storage or unable to securely access our precious data when and where we want it. A short while ago, I stumbled upon an interesting Silicon Valley cloud storage startup called Bitcasa that seems to be addressing the two key storage issues of our time – quantity and easy, secure access. Tony Gauda and Kevin Blackham founded Bitcasa in July 2011 in Mountain View, California. Bitcasa does not seem like one of those three-day wonders that promise you the moon and the sun and quietly vanishes on the fourth day. The Mountain View, California fledgling has won the confidence of prominent investors in Silicon Valley. Just today, Bitcasa announced it’d raised $7 million in a Series A round to take its total backing to $9 million. Bitcasa’s backers include Pelion Venture Partners, Horizons Ventures, Andreessen Horowitz, First Round Capital, CrunchFund and Samsung Ventures. No, Bitcasa is not just another cloud startup copying your files to the cloud as a backup. But Bitcasa is not one of them. 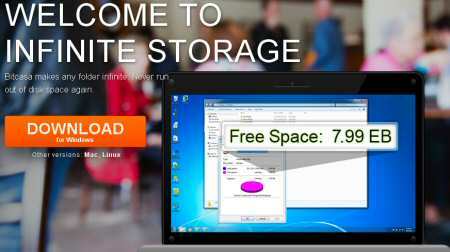 Instead, what Bitcasa offers is infinite storage right on your desktop. And the way Bitcasa does that it is via a Windows or Mac client that you download off the company’s web site. Bitcasa’s technology integrates ‘infinite storage’ into the operating system. From then on, any thing you add to that folder does not take up space on the local system. When you want to access a file in that folder, Bitcasa instantly streams it to your local computer. To allay user concerns on security, Bitcassa encrypts the data on your PC before it’s uploaded to the cloud. * Instant Downloads – Files instantly appear on your desktop and mobile devices. * Anywhere Access – Instantly access your data from any device. * Instant Send – You can send terabytes of data to friends, colleagues, business partners or family members. * Easy Sharing – Since Bitcasa transcodes and streams your data, folders you designate for sharing with others show up instantly on their desktops. They do not have to wait for entire files to download to access the shared content, be it a Bollywood or Kollywood movie or a huge CAD file. Bitcasa works on both the PC and Mac. Just in case you’re wondering, Bitcasa lets you access your precious files from your mobile device as well via the Bitcasa Web Portal at portal.bitcasa.com. Right now, Bitcasa is offering an attractive promotion – Pay $99 for 1 year and get 1-year free. I am not a Math genius but the calculator on my iPhone tells me that’s $4.125 a month for infinite storage for two years. Bitcasa is targeting its infinite cloud storage service at consumers and small and medium businesses. The service is officially in beta (test) but you can test drive it. By the way, Bitcasa is throwing in a free option as well with 5GB of storage. If you want to know more about Bitcasa, visit the cloud storage startup’s web site.